When to Align Baby’s Meals with the Family’s meals. Get the whole family eating meals at the same time each day. Mealtimes kind of naturally fall into place as far as lining up with the family. Both of my kids ate breakfast at the same time as the family from the beginning of solids. Lunch came when they moved to a four hour schedule. I didn’t move Brayden to eat with us at dinner until he started eating what we ate at dinner, which was after he was a year old. If you are having a meal and the baby is up but doesn’t need to eat, I have them eat finger foods so they are with you at the table. I have Kaitlyn eat finger foods at lunch because she eats her solids and then Brayden and I eat our food. I think the reference to solids aligning with the family’s mealtime is more of what the natural progression is over time. Babywise says that will happen, but they also say to do solids at 7-11-3, so I don’t think they mean to eat dinner at 3 or to move the baby’s dinner to 6. We eat dinner around 5-5:30, but Kaitlyn eats dinner at 7:00. She will move up once she is older and feeds herself for the most part. This would also coincide with the time that she starts eating what we eat instead of baby food. At lunch I feed her then she eats finger foods while Brayden and I eat. A good thing about having the baby be there for meals is that they can see early on what proper table manners are and also so they are part of the social environment of meals. If your baby/toddler is old enough to eat what you eat, have them eat breakfast, lunch, and dinner with you. I have a friend whose family eats dinner around 6:00-6:30. That was (and often is) too late for her son to wait, so she gives him a small snack after the afternoon nap to get him to wait for dinner. 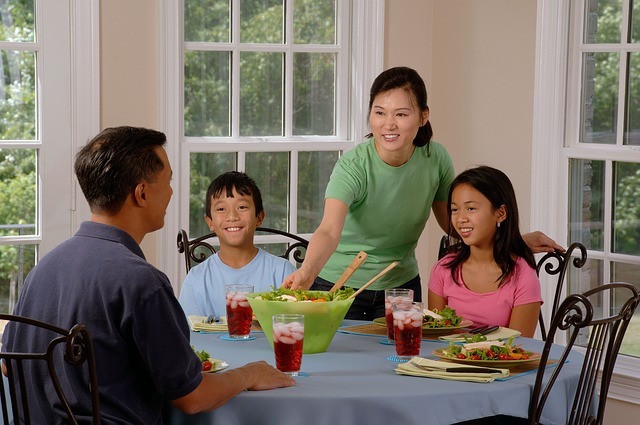 Family mealtime is a great way to spend time together and visit about the day. Make an effort to have it be the norm from a young age. Adjust the schedule according to when you actually wake up, nap, eat meals, and go to bed. You might have to adjust exactly when you eat meals (maybe you don’t eat lunch or dinner that early) to create a schedule the whole family can be together for. Hopefully this can give you an idea of how to make it work for you. Ok, Val, I know I have 2 more months before I want to start weaning, and that the 3rd bfeeding time (now at 3 pm) will be the first to go, and I want James to start eating at our dinner time (around 6). So for now, what should I do? How/when is Kaitlyn eating dinner now? I remember you said you’re giving her solids at her last feeding instead. But could I just bfeed at 3 then offer a snack of finger foods instead of a full meal, then feed him solids at our dinner time (6), then breast feed him again at 7? Would he even eat that close together? This is how our evening goes right now: 3:30–breastfeed then some finger foods5:30ish–the family eats dinner. She will sometimes eat finger foods, but is usually not that hungry then. She will play with toys and just sit with us.7:00–nurse and dinner I would just offer him some finger foods at 6. I would try to make the finger foods something that isn’t filling and maybe even takes him a long time to eat. A couple of things I am thinking of are those Gerber rice puffs (it takes somewhere between 75-85 of them to equal 25 calories) or the biter biscuits (those take Kaitlyn a long time to eat the whole thing). Once he is weaned from nursing, you will be able to do milk and a snack around the 3ish feeding, then do full dinner at 6 with the family. Previous Post Solids: What do they eat at each meal? Next Post How Much Food Will Baby Eat at Each Meal? My son is 8 months and I am trying to figure out an eating schedule for him. How much formula should he be having a day? Should he have formula at every meal? I breastfeed, so I am not sure about number of ounces for an 8 month old. He should have 4-5 liquid feedings for sure each day, though. My kids both did 4 at that age, but some do 5. You might check out the book Super Baby Food for ideason number of ounces for him. Ok, I have a question. We have aligned our 8 month old daughters meals with ours, offering her a snack at about 3, with some jucie. Well, she’s actiging more and more lately like she isn’t interested in the milk after her meals. Would you suggest giving her some milk at 3 instead of juice? If I did that would it confuse her or just allow us to help her get in the milk she needs?We have just dropped the 4th liquid feeding, which she didn’t mind, but now I am even more concerned about making sure she gets all the milk she needs. It seems like my 6 month old is getting hungrier earlier at night. Right now he eat at 7, 11, 3, 7 with solids at 7, 11, and 3. He is on two naps so between the 3 and 7 feedings he is awake. Lately he struggles to eat at his schedules times throughout the day but I have found some tricks to get him to eat. Then, by 5pm-ish he has been incredible fussy and crying without being stopping at times. I knew he wasn’t sick and it was so unlike him to not be able to be consoled. I tried giving him some water and he took it s if he was starving and calmed down. So, I figured he was hungry. Should I just feed him earlier maybe? I was thinking I need to align meals with the family and maybe that will help? Susan, I appologize, I missed your comment until now! LEM, I wouldn’t align meals with the family yet; that is a bit young. I would guess that either:1-he still needs a short 3rd nap2-he is going through a growth spurt and is just hungry earlier3-he just had a growth spurt and now needs more sleep (they need more sleep than usual after the growth spurt of eating is over). Thanks. I think it was a growth spurt time. I have ended up feeding him about 6:30pm instead of 7pm and he goes down for bed a half hour early (7:30pm)I’m still having issues with him being hungry every 4 hours during the day though. He takes his morning bottle and evening bottle fine, but during the day is a different story. I usually have to wake him up from his naps and it’s painful to go in there and know I’m going to have to fight him to drink his bottle. What would be an appropriate age to move to a family schedule?When that does happen, how would I rearrange the schedule? Our morning waketime and bedtime (7am, 7:30pm) works great for us and his waketime is at 2hr 15min right now. LEM,Mine are closer to a year old when meals are aligned with the family–at least all of them. On 4 hours, breakfast is with family, lunch is with family, but dinner usually isn’t. You can wait up to 30 minutes after waking if needed before feeding him. Manisha,You are welcome and thanks!I always worked to keep baby awake for a full feeding at that night feeding. At that age, I would recommend that since that is her 8th feeding and she is in the age range to need at least 8 feedings a day. I would be sure she is taking a full feed–to the best of your abilities. Hi there – thanks so much! I will try my best to keep her awake. She is usually so sleepy and I am afraid that if I wake her too much, she won’t go back to bed 🙂 But I will give it a shot – thanks again! I’ve dropped the 9:00 feeding, and my daughter has been doing great with the new schedule. I was surprised that she could go 12 hours between feedings at night. I really don’t think I dropped that 9:00 feeding with my other girls until I was starting to wean them. I wish I would have discovered your blog back then! Thanks again! Thanks for sharing your success! It is scary to move them to sleeping longer at night, but they usually do great. It is lovely isn’t it! Some more info that perhaps might help -1. She is 11 weeks old. We started CIO at week 2 and began seeing great results in a couple of weeks. She went down for naps easily. But woke up after 45 minutes or earlier often. She now wakes up only after 45 minutes but has not been able to kick that habit.2. As part of her wind-down nap routine at home, I close the shades, swaddle her, rock her 1-2 mins if she needs calming, then put her down in her crib. Give her a kiss, Jiggle her head a lil bit if necessary and say that its time for a nap and I’ll play with her when she gets up and to have a good nap.Thanks! 1. It is totally normal for a baby to wake at this mark while still learning to self-soothe. They usually just need some time to get it down better.The age ranges when moms have tried CIO during the nap again have varied. I think most are around 5-7 months old.2. She isn’t too young to just put her down. I am not sure exactly what you are asking here; does she not go to sleep at the homes of others, or is it just that you think she is too young to do that? I just recently moved my 10 month old’s schedule to align with the family’s. Our previous feeding schedule was:7am – bottle, solids11am – bottle, solids3pm – bottle, solids6:30 – bottle, bath, then bed by 7:15pmNow it looks like this:7am – bottle, solids11:30am – bottle, solids3:30/4- bottle5:30/6 – solids6:30 – bottle, bath, then bedWith this new schedule I feel like his is eating all the time in the afternoon. I guess because I am essentially breaking up the previous 3pm feeding into two sessions. At his “snack” time he takes a full bottle, at dinner a full meal, and another full bottle afterward. He just got over being sick so I know he’s eating more than usual to make up for lost time but the timing of the snack, dinner, then night bottle seems so close together. I feel like the whole purpose to have them take 3 full meals, not grazing all day has been lost with this new schedule. Bedtime has to be at 7:15 because he needs about 12 hours of sleep (in fact I think many times he should go down by 7).Here’s an example: The other day I gave him a bottle at 3:30 for his snack. He took 10 ounces which is a lot for him. Then I went out to an early dinner with a friend where he continued to snack on cherrios and a biter biscuit the entire time we were there. Once we got home it was time for his dinner and he ate a full meal of his regular solids. Immediately afterward, it was time for his 6:30 bottle and he took 7 ounces. Does this sound OK to be eating so frequently in the evenings? I don’t know if I just need some time to adjust to this new schedule and realize that this is OK. But for some reason, breaking up that 3pm feeding seems like I’m going against the BW principle of not feeding bottle at one time then solids a hour or two later. LEM, this is the way I would do it:3:30–bottle with solids OR just bottle5:30–finger foods while family eats dinner6:30–bottle with solids OR just bottle (depending on what you did at 3:30)Once he is able to have only 3 liquid feedings in a day, you can more easily have meals the same as the family’s. Thanks! I think will stick with3:30 bottle and solids5:30 finger foods while family has dinner6:30 BottleSo..once he has only 3 liquid feedings in a day what bottle would I be taking away and what would that adjustment look like?Also, since his naps can be from 1.5 hours to 2 hours, his feeding schedule varies sometimes. He has 2.5 hours of waketime, so he goes down at 9:30 and sometimes wakes on his own at 11 or I wake him at 11:30. This means that sometimes he eats at 11 or 11:30, depending on the nap. Then, his next nap starts depending on when he woke up from his first nap (so maybe 1:30 or maybe 2). And once again, he will sleep 1.5 or 2 hours so his third feeding will be at 3, 3:30, or possibly 4 (if he went down at 2 and slept 2 hours). I wanted your opinion on that. What are your thought on this slight variation from day to day? Should I wake him after 1.5 hours no matter what to keep him on schedule? Or, should I feed every 4.5 hours even if he doesn’t sleep to his next feeding? I just wasn’t sure if I should be varying it as I am now depending on his naps. My daughter will be 7 months next week. She has been on a 4 hour schedule for a month and started solids about the same time. She recently dropped her third nap. Her schedule now is:7:00 nurse/solids9:00 nap11:00 nurse/solids1:00 nap3:00 nurse/solids7:00 nurse7:30 bedI’m running into two issues. First she doesn’t seem really interested in solids at 3. Second, she seems very hungry at 5:30 and wants what we’re eating. I was reading on Growing Kids and noticed that Connie gave the following schedule option:8:00am Bottle / Nurse8:30am Rice cereal mixed with breast milk, Fruit baby food10:00am Nap12:00pm Bottle / Nurse12:30pm Vegetable baby food, Fruit baby food2:00pm Nap4:00pm Bottle / Nurse6:00pm Vegetable baby food, Rice cerealIntroduce solid finger foods while Mom and Dad eat dinner7:45pm Bottle / Nurse8:00pm Sleep for the nightBoth problems might be solved if I nursed at 3 and did solids at 5, but I thought that was considered snacking according to Babywise II. Could you clarify if this is ok and possibly suggest other solutions? Thanks in advance for your advice! LEM,With three liquid feedings, I do one at breakfast, one at lunch, and one at dinner with the family. Kaitlyn went to three liquid at a year, but Brayden didn’t until about 18 months, so just take it at his pace.I think the variation on the feedings is fine. If you want more consistency, the days he wakes earlier you can have him wait 30 minutes before eating if you want to. So you plan to eat at 11:30 each day. If he wakes at 11, you have him wait until 11:30 if he can. Kelly,Kelly,I would consider that snacking, but you can certianly try it if you want to. I know the Baby Whisperer recommends doing liquid, then solids two hours later, then liquid, etc. I would do just nursing at 3, give her finger foods when the family eats dinner, and then nurse and solids at 7. Hello! I am struggling to figure out my sons eating schedule and weaning process. He is only 9.5 months old, but I am just trying to prepare for all of these upcoming things. My first question is: Once my son is beginning to be weaned and starts eating dinner with us (instead of at 3), should I offer the milk in the sippy at 3 for a snack and then eat dinner around 5:30? Then nurse at 7:30 (until weaned from this feeding)? Is this the best way to do this? It seems like a long time for him to wait to eat. Secondly, I am concerned about weaning and would like some advice. My son will be 1 year at the beginning of October. My goal is to have him weaned by his birthday because we are moving to Australia in early November and I would like to be well established with this by then. The only issue with this is that we will be at our training for Australia for the 3 weeks before his birthday, so I will be busy those weeks and he will be in the nursery at the training site. Any advice on what the best timing would be for weaning in order to make this a smooth process? He also doesn't really drink anything from a sippy right now, so this worries me for the future. (He refuses bottles, so this is not an option either). Any advice would be much appreciated! Thank you! Kristin,Yes, at first, you will need to have some sort of snack. Milk might not be enough on its own. So definitely do a light snack at 3 and then dinner with the family. He sounds like McKenna with the drinking. She wouldn't drink from bottles and wouldn't drink milk from sippys. Continue to offer water in a sippy for him right now. So would you be able to go in to him while he is in the nursery to feed him? If so, I think you can still start 2-3 weeks before his birthday. If not, you need to be at least done with the middle two feedings by then (I am assuming you would be able to breastfeed in the morning and night). Then you just have to offer him his milk in a sippy and wait for him to start drinking it. Try to not stress over it. I would also keep water with him at that point. McKenna has a sippy of water with her in bed so she gets enough liquid. Also, don't stress about the milk exactly. He can get his dairy from cheese and yogurt (and other dairy products). If you look at McKenna's summaries right around her birthday, you will see some info on how I did that. She still only drinks 8 ounces of milk a day, so I still offer her other forms of dairy. Kim,I would apply the rules of moving to a 4 hour schedule when deciding if you should move or not. I think her dinner time is fine since it naturally falls there anyway. I would leave it so long as it is her normal time to eat. It is when they nurse and then you do solids at 5:30 that it isn't a good idea (in my opinion). I have a question. I have a 6 month old. We having been eating solids for one month now. I am a full-time, breastfeeding/pumping mom. His current schedule is 6:15, 10:00 (with cereal), 2:00, 5:30-6:00 (with veggie and fruit), 8:00 then bed. I know he is too young to align with family meal time. But my question is 1. When do I need to add the 3rd solids with meal? 2. When and how do I need to drop that 5th bottle? I feel like we are close to dropping that last feeding and maybe having it around 6:30-ish. But by that time, he will be starving and I read somewhere not to serve solids with your last feeding of the day. Any advice? Joey and Kristin Lindley,1. You can do it whenever you are ready for it. 2. I did solids for my last feeding with two of my kids. The possible issue is blood sugar spikes that can interfere with night sleep. We never had that issue. You can try slowly decreasing the ounces he gets at 8 PM and see how he does. If your schedule stayed as is, I would try to do solids at the 6:00 feeding because that is around a normal dinner time.